Businesses strive to improve and transform their operations in order to compete, and IT departments are right in the mix—working hard to improve service effectiveness in the face of staff and budget constraints. With help from Ivanti solutions, IT teams can get even more done and find time to focus on core business objectives. Ivanti’s Patch Intelligence tool, available via the Ivanti Cloud, combines patch data from Ivanti’s extensive multi-platform and third-party vendor patch catalog with patch reliability and security metrics. It breaks down the barriers between IT Ops and Security teams, helping IT departments manage the potential business continuity risks associated with patching, which for most organizations is the biggest obstacle to rolling out patches in a timely manner. You can use the reliability metrics to optimize your delivery of patches in order to fast-track patches that have a high probability of success with no side effects. Also through reliability metrics, you can get early warning of potential issues as well as any possible mitigation steps suggested by other users. You can rank outstanding bulletins by the most serious first, giving you a priority order to apply patches to resolve the largest problems first. Not only is Patch Intelligence a proactive tool used by IT Ops teams to plan the deployment of patches, it can also be used reactively. For example, technical support investigating an issue may check the reliability ratings and feedback for recently applied patches that may be pertinent to the issue they are investigating. In this brief overview video, Robin Rowe provides the following explanation of Patch Intelligence. For starters, you can search, sort, and filter, based on a number of attributes. By clicking into a bulletin, you can see further information and also the patches contained within that bulletin, including supersedence information and any informational comments that have been left. These comments can help the patch administrator or IT Ops engineer understand why a particular patch may or may not have rolled out smoothly and any additional steps that may be required. 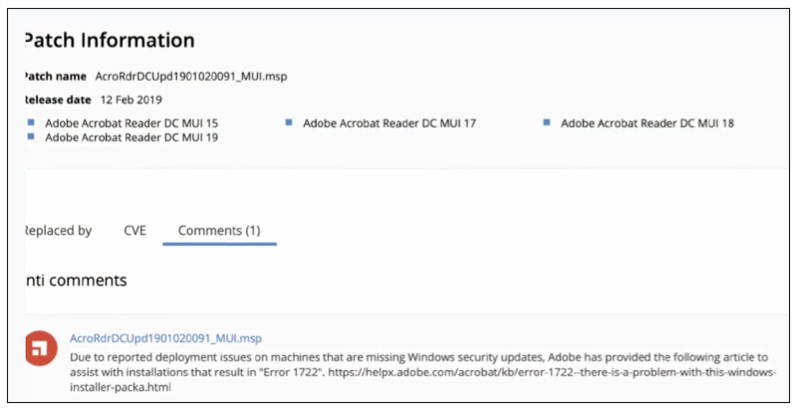 "As an IT Ops engineer, I want to understand why AcrobatDCUpd1901020098.msp deployed on some endpoints but not others." 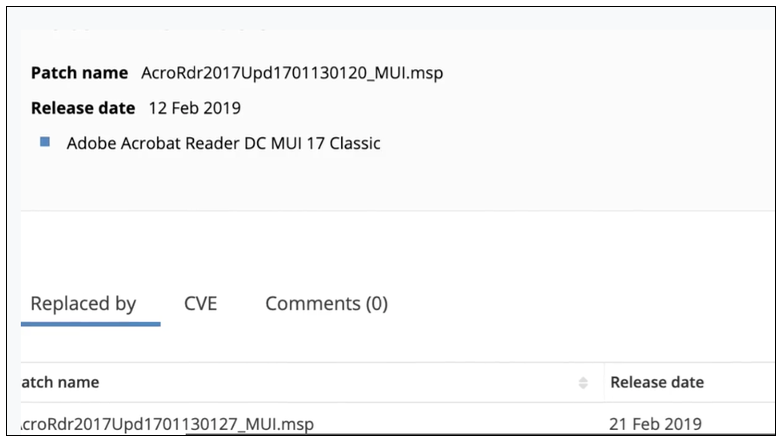 The searching functionality can be an asset to both the Security and IT Ops teams by allowing them to search for CVEs and see which patches are required. "As a security engineer, I want to supply a CVE to Patch Intelligence to understand what patch I need to have my Ops team apply to mitigate the vulnerability." "As a support technician, I want to know whether a patch is available to fix an issue with PST corruption in Outlook 2016 occurring in conjunction wth error 0x80040119." The Ivanti Cloud delivers real-time intelligence into CVEs and recommended patches that help you streamline patching. And thanks to the CVE-to-patch import capability in Ivanti solutions such as Ivanti Security Controls, you can streamline the process from hours to minutes. 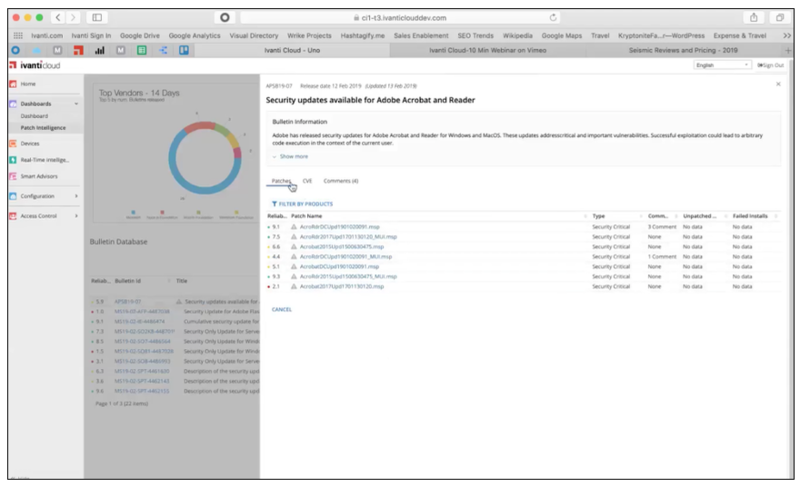 Whether you’re using vulnerability assessments from Rapid 7, Tenable, Qualys, BeyondTrust, or another vendor, Ivanti Security Controls maps the patches that relate to those CVEs and builds a patch list of updates that you can quickly approve or publish for remediation in your environment. This is essential given that a single vulnerability assessment may find multiple problems on systems throughout your environment—and the same vulnerabilities can appear on many different systems and in many pieces of software on the same system. If you’re interested in a demo of Patch Intelligence, please email [email protected]. Also, take a few minutes to learn more about the Ivanti Cloud.